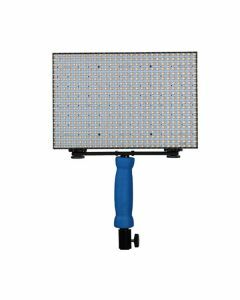 The Ledgo B560C is a 560 Bi-Colour LED modular dimmable camera top light that allows you to combine multiple lights to make a larger LED panel. The B560C has a colour temperature range of 3200K-5600K and a manual dimmer. Included with the LED is a filter set (containing a diffuser, extra soft diffuser and blue filter), a handle, a AA battery box and a carry case.